KitchenAid, Keurig and more brands from Target Holiday Ad with the deals that are effective until December 8. Kitchen appliances are thoughtful Christmas gifts in my opinion. Target has lower prices than regular. Again, free gift cards will be given away when you purchase certain products like OXO POP 5-pc. container set which is $49.99. Save up to $40 on a single item on pg 24-25. Multi-cookers, stand mixers, kitchen gadgets and more on sale. All KitchenAid products are on sale. Get an additional 25% off kitchen appliances and cookware on Dec 8-9. That weekend sale seems really profitable just like the deals on vacuum cleaners. Shark, Dyson, iRobot and more cleaning appliances might come in handy when you need to clean your entire house. Shark Navigator lift-away deluxe is one of the products there and it will cost you $149.99! Save $30 on that device. Steam mop, slim steam, handheld vacuums, and more will be in stores and online for the prices on the ad. The ad also has grocery, household, food, laundry and more categories. 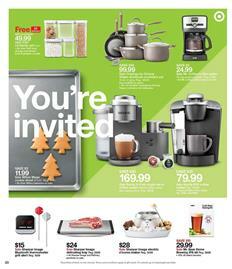 For more of the Target Weekly Ad Dec 2 - 8, please see the ad page.